“So, when you change, then the authority is lost. Just like in our society, sometimes they do something nonsense and they say, ‘Prabhupada said.’ (laughter) They are doing that. We know that. It is deteriorated like that. 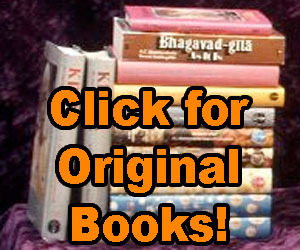 The original Bhagavad-gita As It Is is clearly approved and authorized by Srila Prabhupada. Prabhupada requested a couple of small changes be made including changing the incorrect reference to “cattle raising” to “cow protection” in the Eighteenth Chapter. Some have complained about “the Blessed Lord said…” which is used in many places in Srila Prabhuapda’s Bhagavad Gita As It Is, suggesting that this should be changed to “The Supreme Lord said…,” however the abridged edition of Bhagavad-gita As It Is was published in 1968 and it clearly says “The Blessed Lord said” in many places and Srila Prabhupada reads it himself many times on folio and on the audio recordings and he hears it read by devotees so many times, but he never says it should be changed. If Srila Prabhupada wanted to change “the Blessed Lord said” to “the Supreme Personality of Godhead said” he had nine whole years to request the change. If he wanted it changed he could have easily asked the devotees to change it before 1972 when the unabridged edition was printed. But Srila Prabhupada did not request anyone to change it. “To my knowledge, SRILA PRABHUPADA NEVER ASKED US TO RE-EDIT THE BOOK. Jayadvaita Swami has the audacity to say this after making more than one thousand [mostly completely needless] changes to the book! It’s not a question of arguing a particular change is good or bad. ANY unauthorized change destroys the AUTHORITY of the book. So one does not have to be a great scholar to notice “contoling the senses by the mind and engaging in works of devotion” is NOT NOT NOT the same as “TRYING to control the senses and beginning karma yoga? ?” Do we no longer have to control our senses and engage in works of devotion? Is is enough to just TRY to control our senses?? Srila Prabhupada: No. If one’s mind is perfect, he may give a meaning, but, according to our conviction, if one is perfect, why should he try to change the word of God? And if one is imperfect, what is the value of his change? Srila Prabhupada: Interpretation means change. If man is imperfect, how can he change the words of God? If the words can be changed, they are not perfect. So there will be doubt whether the words are spoken by God or by an imperfect person. Disciple: The many different Protestant faiths resulted from such individual interpretation. It’s surprising to find this viewpoint in Aquinas. Srila Prabhupada: AS SOON AS YOU INTERPRET OR CHANGE THE SCRIPTURE, THE SCRIPTURE LOSES ITS AUTHORITY. Then another man will come and interpret things in his own way. Another will come and then another, and in this way the original purport of the scripture is lost. Jayadvaita Swami is just the beginning. He will be gone and another chief editor of the BBT will change Srila Prabhupada’s “Bhagavad-gita As It Is” again, of course he will, like Jayadvaita, only make the changes that seem worthwhile to him… BUT THE ORIGINAL PURPORT OF THE SCRIPTURE IS LOST by such changes. Yasoda-nandana: In the Gurukula we were teaching Isopanisad class to the children. So we took… (break) …Prabhupada and the words which the recent edition of the Press is wrong. Many changes were brought. They were trying to make better English, but sometimes, to make better English, I think they were making philosophical mistakes also. There is not so much need of making so much better English. Your English is sufficient. It is very clear, very simple. We have caught over 125 changes. They’re changing so many things. We are wondering if this is necessary. I will show you today. I have kept the book. Prabhupada: I know that these rascals are doing. What can be done? How they can be relied on?… And Ramesvara is indulging this. The great rascal is that Jagannatha? He’s there in Los Angeles… Jagannatha-suta… And the one rascal is gone. Prabhupada: It is starting. What can I do? These cannot… These rascals cannot be educated. Dangerous. Little learning, dangerous. So how to correct? The leader of these dangerous–Radha-vallabha. Hm. He’s a dangerous, who maintains these rascal with this work. He’ll always have questions and alteration. That is his business. That is American business. Prabhupada: …Now do the needful. OTHERWISE EVERYTHING WILL BE SPOILED. These rascal editorial… That Easy Journey, original, this (indistinct) Hayagriva has changed so many things. Tamala Krsna: He actually took out the whole part about their going to the moon being childish. He deleted the whole section. Yasoda-nandana: Also in the Bhagavatam, where Prabhupada was talking about Lord Buddha… You mentioned that if the followers of Lord Buddha do not close the slaughterhouse, there is no meaning to such a caricature. That word was very nice. But in new book that word is not there any more. They have pulled the word. The meaning of the word is not… So many times. Prabhupada: So you… What you are going… It is very serious situation. Prabhupada: So what to do? Prabhupada: So you bring this to Satsvarupa. THEY CANNOT CHANGE ANYTHING! Prabhupada: So on the whole, these dangerous things are going on. How to check it? One should accept the instructions of the Supreme Personality of Godhead by bowing down at the lotus feet of the Lord. This means that anything spoken by the Personality of Godhead should be taken as it is, with great care and attention and with great respect. It is not our business to amend the words of the Supreme Personality of Godhead or make additions or alterations, as it has become a custom for many so-called scholars and svamis who comment on the words of Bhagavad-gita. Here the practical example of how to accept the instruction of the Supreme Personality of Godhead is shown by Prthu Maharaja. This is the way to receive knowledge through the parampara system. Regarding your editing, I would very much like it. I am sending my lecture copies to you. I think my other copies are lying on the left side of my seat in a cardboard box which please find out. Please be careful not to change the ideas. Brahmananda & others cannot change the style. They want to see if there is any grammatical discrepancy. I have sent a few tapes to Bhagavan das. He sends to you his edited copies and they may be made final. I want two editings only, just to see if there is any grammatical or spelling mistake. Your present program of two editions first by yourself and then by Jayadvaita is a nice arrangement. 70-04-28 Letter: Pradyumna Please accept my blessings. I have just received the blueprint copy of KRSNA, the Reservoir of Pleasure and I have begun to read it through. But I notice that there are some points you should correct before the final printing. I have already noted you the injunction that you should change the pretipadika artha to first case ending instead. Sannyasin should be printed Sannyasi, etc. So please correct these. Another point is that there are some errors in the English also. On page 2 it should read “. . . decided to kill his sister, Devaki.” but it has become sisters, plural. Then, what does it mean? : “The Lord’s compromise was that He had Vasudeva propose . . .” This does not seem to be very clear or at least it is very awkward expression. So please see that the editors make a very careful final proofreading before printing the final copies. I have dictated the missing purports from Chapter IX and they are set enclosed herewith. So far changing the working of verse or purport of 12:12 discussed before, it may remain as it is. Please accept my blessings. I am in due receipt of your letter dated October 3, 1974 and have noted the contents. I am very glad to learn that you are translating the Bhagavad-gita As It Is into Portuguese. Be careful not to change anything but present it exactly as it is. This is how we receive Bhagavad-gita through the disciplic succession as stated in the Fourth Chapter. By this translating work you will learn our philosophy very nicely. It is very important to broadcast Krishna consciousness all over the world. This is the great need of modern civilization. I am glad to note the publishing work you are doing, and I look forward to receiving the books printed. I am pleased that you are personally seeing to the translation how it is done. Actually these books are the foundation stone of our movement. Whatever we are is resting on these books, so far reading them and distributing them. This should be our only motto. Regarding publishing the Life Comes From Life in English it should be grammatically correct because it is written book. Yes, it will be very good if you publish a book of lectures. Regarding going to New York, oh yes, certainly you can go. I have telegramed Bali Mardan to come here but not yet received any reply. I will have to see personally what are the mistakes in the synonyms and also how you intend to correct them. I was not satisfied with the corrections that were made before. I saw some changes which I did no approve. Nitai may correct whatever mistakes are there, but the corrected material must be sent to me for final approval. So reprinting the volumes will have to wait until the mistakes are corrected and approved by me. In the meantime you can supply the standing orders whatever new volumes are published. Please accept my blessings. I am in due receipt of your letter dated April 22, 1976, and I have noted the contents with care. Yes, there is no need for corrections for the first and second Cantos. Whatever is there is alright. Once Pradyumna comes to join me here from India, then there will be no need for Nitai das or Jagannatha das to edit the Srimad-Bhagavatam. You may title this book, Teachings of Lord Kapila, but it must be subtitled, “The Son of Devahuti“. That will remain, do not try to change it. The Americans may like it or not like it, but we must make the distinction between devahuti putra kapila, and the atheistic Kapila. Do not try to change anything without my permission. Titling of the Ninth Canto as Liberation is good, and the Tenth Canto should be called “The Summum Bonum”. As far as the 11th and 12th Cantos are concerned they shall be named when they are presented. The title which you have given to the Eighth Canto was a little hard to understand at first but if it refers to pralaya, then it is alright. You must consult with me on such matters. Do not manufacture anything. Please accept my blessings. With reference to your letter to Harikesa dated 21st inst., regarding the purport, 2nd paragraph to Bhagavatam 2.2.38, it is clear. Do not try to change anything. I want to distribute original books in USA. Please tell me who is doing this. Thanks. Very good. The best way for you to make advancement in Krishna consciousness and to please Srila Prabhupada is to surrender to him and dedicate your life to distributing his transcendental books. Prabhupada says “If you love me distribute my books.” If anyone is actually a disciple of Srila Prabhupada then distributing Prabhupada’s books will be the purpose of his life.